UMD softball coach Jen Banford. Photo: University of Minnesota Duluth. Another female coach at the University of Minnesota Duluth is reportedly out. ESPNw reports that softball coach Jen Banford has been informed she will not have her contract renewed when it expires. She received notice the same week that women’s hockey coach Shannon Miller would not be retained, a move that has sparked controversy at the school. Just as in the Miller case, what the coach is saying and what the athletic director is saying don’t add up. Athletic director Josh Berlo told ESPNw that he is “redefining Banford’s appointment.” She’s also the director of operations for the women’s hockey program. He said he expects Banford to stay on for the upcoming softball season. A letter from Berlo suggests otherwise, however. This confusion with Banford comes just weeks after Minnesota-Duluth announced that it would not be renewing the contract of women’s hockey coach Shannon Miller, who has won five NCAA titles in 15 seasons with the Bulldogs. Banford said she believes she is being retaliated against for supporting Miller and the women’s hockey program. The 33-year-old Banford has retained legal counsel to combat the discrimination she alleges against UMD. Banford said the athletic director hasn’t talked to her in six weeks. A spokesman for the University of Minnesota Duluth told the Duluth News Tribune there are plans to talk to Banford this week. Since her arrival at UMD in 2005-06, Banford has directed the Bulldogs to a 273-169 overall record (a .618 winning percentage), four NCAA II Central Region berths and one Northern Sun Intercollegiate Conference regular season title, according to the university. Sounds like some enterprising journalist should be looking into the inner workings of the UMD athletic department. You might find a story. Someone should investigate this. The local media haven’t and probably won’t until these coaches are gone. Miller has been a bully since day one and would do anything she needs to in order to destroy a media member that goes against her. Actually, the local media (Duluth News Tribune) is trying to dig in pretty hard. The only problem is that UMD Administration is doing everything they can to prevent new information from being exposed. A lot of personnel directories are being locked down, even though they are required to be public knowledge. UMD Admin is reportedly threatening staff and faculty to keep them quiet (no proof of specific threats, but several professors and low-level personnel within the Athletic Dept. have stated that they “feel very threatened” by the actions of UMD Admin). With all of that going on, and the continued silence of UMD Admin, the Duluth News Tribune hasn’t been able to gain a lot of new information, let alone publish anything. If you don’t believe me, check out the Facebook page “Reinstate Coach Miller and the UMD Women’s Hockey Coaching Staff”. The people behind that page, and several supporters, have done a TREMENDOUS job researching, finding, and publishing any information. Many of the page’s supporters are UMD Alumni (such as me), UMD staff/faculty, and Title IX/Equal Rights attorneys, who are usually better-informed on this case and its specific issues than the local media. It certainly appears that the University of Minnesota is guilty of sexual prejudice and oppression of females in a male-dominated society. Couldn’t be possible NCAA violations? Successful programs run into those problems more than less successful programs. A chance to burn a coach and save a program(s) by saying the firing was because of NCAA violation would be a huge PR win. Why would they ‘keep’ her as softball coach, or allow Shannon Miller to finish the hockey season. No chance it is NCAA violation related. Gary, in the case of a significant NCAA violation, the coach usually isn’t allowed to finish the rest of the season before being officially released. Shannon Miller is still coaching the women’s hockey team through the end of this season, and Jen Banford is being allowed to coach the entire 2015 season, which hasn’t even officially started yet. Combine that with the silence and secrecy that UMD Administration has tried, but miserably failed, to maintain, and there is no possible chance that this issue is tied to a major NCAA violation. The non renewal notice that she just shared with the media this weekend was dated mid December. Why did she wait 6 weeks to bring this up? And her one contract is for BOTH positions she holds at UMD. Administration said they were retaining her as coach not DOHO. She part if the media scrum she said she was dragged into and should lose both positions because of that fact alone. 2015.” There is also no mention within that letter that even suggests that Banford’s contract is merely being “modified” or “redefined”. UMD Admin has already been caught in several blatant lies and MN State/University of MN policy violations, so why would you listen to UMD Admin trying to claim something other than their original position? She also received a new contract for softball only but chose not to take that one to the media. Everyone knows that she only released the one she did is because Miller told her too. Phil, if Banford has already received a new contract, then why hasn’t UMD Admin gone public with that information? It’s been two weeks now, and there is absolutely zero evidence that Banford has even been offered a new contract, let alone signing one. Also, from UMD’s perspective, wouldn’t it be AMAZING if UMD could turn this whole thing against Banford with a simple “Here is the new contract that UMD has offered to Banford, and Banford has refused to sign”? So don’t try to tell me that “She is the one refusing to sign the new contract” unless you can show me a legitimate contract addressed to Jen Banford on UMD letterhead. Even though the likelihood of anyone seeing this is probably pretty slim by now, I still feel like I should correct myself. Now that new information has come out (a Duluth News Tribune interview with Jen Banford), I have to admit that UMD did offer a new contract to Banford. I apologize for jumping the gun. However, allow me to share a few points on said contract offer before anyone says “I told you so”. 1. Berlo sent the contract offer to Banford by way of email. Not a printed letter (the standard form of pretty much all legal communication ever), not a face-to-face discussion, not a telephone call, but an electronic letter sent over the internet. 2. 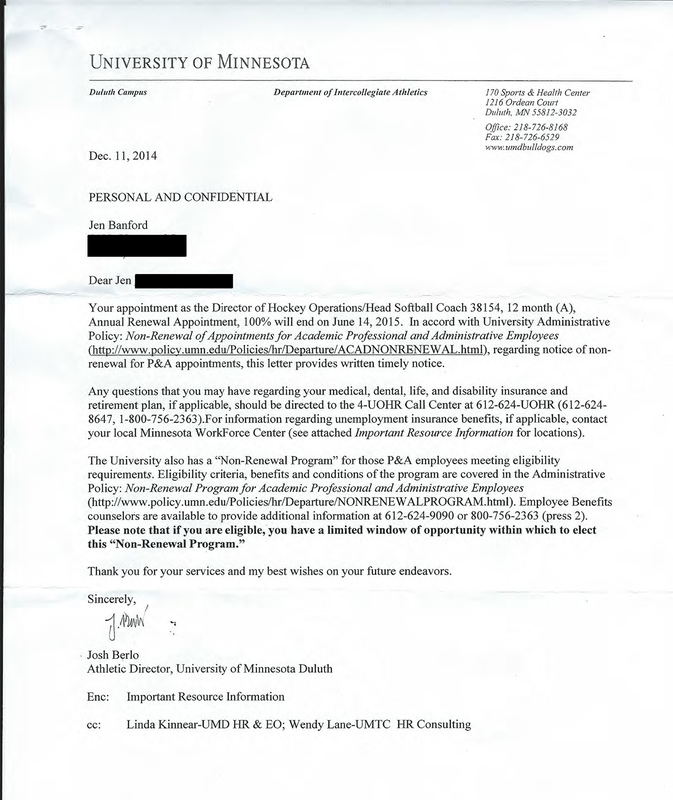 UMD Admin set the “signing deadline” of Banford’s new offer to take place the day before UMD Softball left Minnesota for their season-opening tournament in Arkansas. That timing meant that Banford had only 6 weeks to make her decision, and she had to make that decision at the very beginning of UMD Softball’s official 2015 season. 3. UMD Admin did give Banford an opportunity to meet with Berlo and others, but the “only available time slot” given to Banford happened to coincide with UMD Softball’s designated practice time. Anyone still supporting Berlo’s “professional leadership”? To add to your point, the contract came three weeks AFTER Banford finally went to HR and said, “Do I have another job coming or not?” HR told here there was nothing in the system to indicate that she was to be offered a new contract. Nothing. This entire fiasco is an embarrassment for UMD and the city of Duluth. Berlo and Chancellor Black are doing their best to pull women’s sports at UMD back into the Dark Ages. New leadership is most definitely needed and fast! Consider the fact you really don’t know everything that is going on, to be so negative about the UMD Athletic Director is not only irresponsible but, toxic. You don’t know all the facts, maybe Miller is in such denial that she can’t see the truth. To say people are jealous of her making more money then most coaches is just immature. If she was doing a really good job as a coach it is warranted, but she has shown she is has been sitting on her laurels the last few years. The fact we don’t know all the facts doesn’t require us to suspend critical thinking skills and apply what we’re told by one side against what we are told by the other. It really has been botched by the UMD people, even if they are operating with the most pure motives. They said it was purely financial, then it was revealed there was an offer to work for less and that the University didn’t want to negotiate. Later UMD admitted it was about more than finances, but wouldn’t reveal what it was. UMD has refused to respond to inquiries on the subject, even though it is a public school and have a right to question it. You’re right. We don’t know what’s going on here. And the best way for us to remain ignorant of what’s going on at a public institution, is to merely ignore it. “Critical thinking skills”. Lost on so many. Housekeeping: NewsCut requires real names and valid email addresses for comments.